There’s more to photographing wildlife than timing and luck. Photographer Chris Eyre-Walker explains how to take safari snaps with animal instinct. Wildlife photography puts even the professionals to the test. You can’t plan a wildlife shot the way you can a landscape – you never know how your subject will behave. And, when you’re on safari, you’re usually stuck inside a vehicle. But then, when all the elements align, allowing you to capture that golden moment, it’s one of the most rewarding types of photography. Being in the right place at the right time is essential, but there are still steps you can take to increase your chances of getting an excellent shot. Here are my tips and techniques to help put the odds in your favour. A telephoto lens helps you get up close and personal. Read up about the wildlife you might observe. Know when and where to expect each type of creature. Animals are like humans – they have habits. In Africa, the midday sun sends most animals into hiding, so your best chance of spotting the local fauna is at sunrise and sunset. Birds follow routines too. Seek out where they are nesting and wait. Watch as they come and go – this is when you will capture those detailed and more exciting photographs of birds in action, and the flora around them will give perspective of their size. Know the land and climate, as well as your prey. Study a map. Find waterholes and big open plains. If it’s the dry season animals will congregate at permanent water sources. Come rain, there’s more grass in which to hide and the local fauna will be less desperate for a drink, making your endeavour a bit more challenging. Earlier this year I visited Namibia’s Etosha National Park and saw a pair of lions – the pinnacle of safari finds – on my very last day. I was surprised at the number of travellers who drove up for a glimpse and departed. Everyone had journeyed all this way to see this iconic scene and yet they were too impatient to stay, wait and observe. The lions luxuriated in the sun, partially obscured by shrubs on the ground, but after half an hour they roused and padded through the plain, giving us a clear view of their powerful haunches and self-assured gait. No one else was left to enjoy the moment. So remember, animals don’t just stay in one place. When you first spot a creature it may be concealed by trees or too far away to capture. But if you’re patient enough that springbok might prance into the right light or a pack of hyenas could lock onto prey. Let interaction tell a story. Picture those classic safari images – a giraffe in front of a blood-red African sunrise, or the perfect reflection of a lion lapping at a waterhole. The key to these images is light. Capturing the right light is every professional photographer’s mantra, and you’ll find it’s the simplest way to improve your photographs. Not only are most animals active around sunrise and sunset when the scorching sun tempers, but the soft glow enhances your images and you can play with colours and silhouettes. Be the first on location in the morning and experience the magic of observing the world at the crack of dawn. Then head back to base and do what the wildlife does: take a nap. In the late afternoon, set off again to watch the creatures come to life for a second time. When it comes to photographing wildlife you can never get close enough, so a telephoto lens is a pivotal part of your arsenal. On safari I keep my Olympus M.Zuiko 300mm f/4 IS Pro lens close at hand (I’ve used it for most of the images illustrating this article). It’s the equivalent of a 600mm lens for a full-frame camera, but with the advantage of weighing less than 1.5 kilograms, so it’s incredibly portable. The built-in lens image stabilisation also works in combination with the camera body stabilisation, allowing you to use this lens without a heavy monopod or tripod. And if you’re witnessing a lion dashing through the savannah, you don’t have time to carefully reposition a prop. Mix up the type of photographs you take. Be sure to show your subject interacting with the environment around it. Then make use of your telephoto lens and get up close for a personal shot. Paint a picture through variation. Your final gallery should be all about the abundance of wildlife you observed and the landscape you explored. Don’t forget trees, plants and any clouds clinging to the sky – they’re all characters in your safari story. There’s more to an African safari than the Big Five. Look for life on every level. If you’re having a slow day and haven’t spotted a coveted elephant or rhino, don’t fall into the trap of feeling as though you’ve seen nothing at all. Pause and observe the smaller things. Lock eyes on birds and insects, watch for the glimmer of a skink or the supple armour of a puff adder. Scour the ground for animal tracks. You’d be surprised how much is actually going on when you stop and listen. And even if you’ve seen an abundance of the same species, consider if you’ve really taken the time to properly observe them. What might seem ordinary after a while will become special once more when you return home. 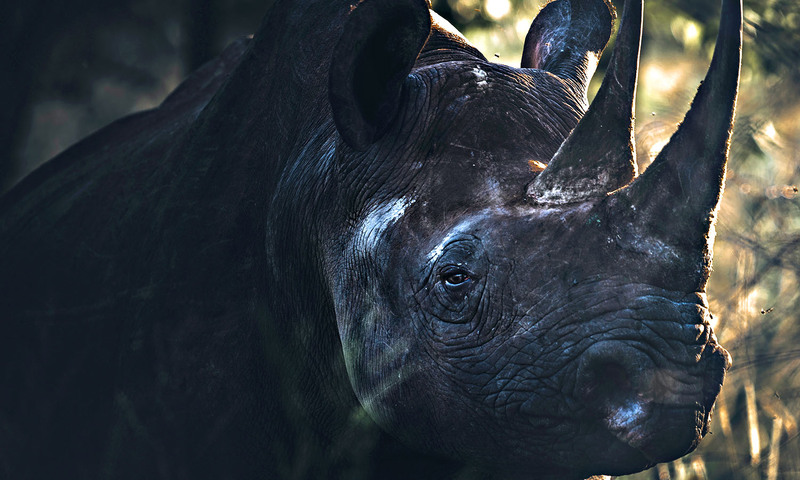 Spotting a rhino up close was one of the most special moments on my Namibian safari. On this particular day, we had almost given up on seeing a beast lurking in the vegetation when we happened upon a family of rhinos: a male, a female and a baby. We stopped, killed the 4WD’s engine and I whipped out my camera. Our curiosity was reciprocated, and the male rhino decided to approach our vehicle. When I shot his portrait he was standing just five metres away, carefully assessing us. After taking a few frames I put down my camera and simply enjoyed this unexpected connection. Moments later he turned around and trundled back to his family. In total awe we returned to camp.